Are you organizing thousands of jobsite photos to monitor project progress and communicate with stakeholders? Find out how construction managers are leveraging 3D scanning and 360˚ photography to reduce rework, increase trust with clients, and shorten field-to-finish time on projects of all sizes. Construction managers from firms like Gilbane, Hensel Phelps, Mortenson, and more are using Matterport's 3D scanning and virtual reality platform to minimize rework costs, reduce site visits, mitigate risk, and impress clients by offering innovative, interactive 3D project communication. 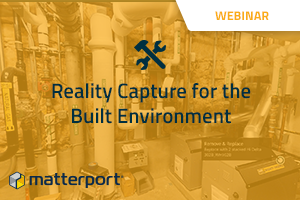 In this on-demand webinar, you'll learn how to end field-to-office misscommunication with simple, contextual, visual 3D scans of your job sites. Traditionally, construction managers have to wade through thousands of construction site photos in order to understand job site progress and give clear direction. Firms leading the digital transformation are leveraging Matterport's quicker, easier, more affordable 3D scanning platform to create interactive 3D models of their in-progress job sites. Using data tags anchored to points in the model, they can create visual punchlists, identify additional work, or issue clear approvals to the field. Once a project is done, a turnover package can be delivered with the interactive, photographic 3D model tagged with spec sheets and additional info to aid facilities management down the line, giving firms a new way to impress and delight their clients.